This was very well received and became very popular. This is a part-2 to that post. 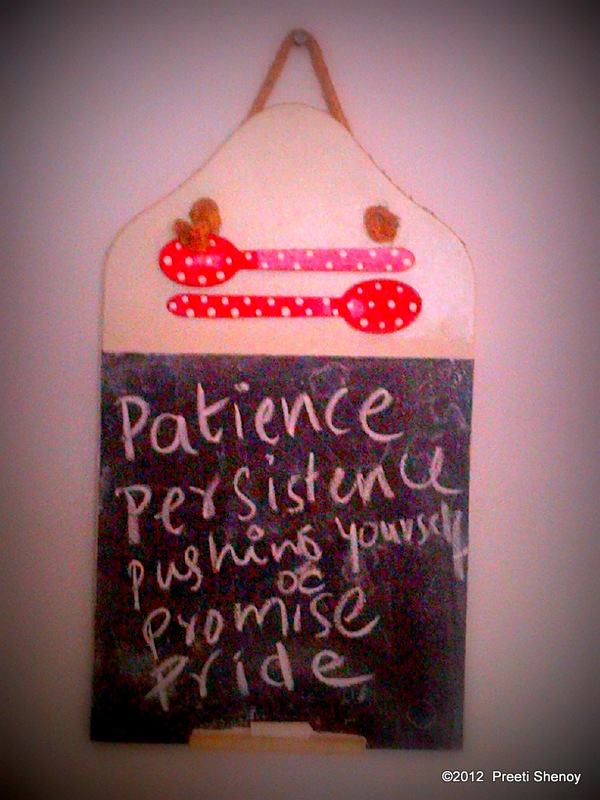 I have this little black board in my kitchen. I write on it, messages for my family and sometimes, whatever happens to be on my mind at that time. My children too use it to express themselves. We write quirky stuff, amusing stuff, and at times just messages of love and gratitude. I love this little black-board (the one you see in the picture above). The other day, I was just thinking, what are the core qualities that one needs for success--be it success in anything--personal goals, professional goals or even just achieving what you have set your heart out to achieve---something you badly want? The 5 p's scribbled on the board is what I came up with. I was thinking mainly from a writer's perspective but later felt these could be applied to anything--hence sharing them here. No matter what you do, instant gratification is something which is rare. Results take time. It can be very frustrating to wait, once you have done all that you can do. But most of the time patience pays. Believe that whatever has to come to you, will come to you at the right time. If it doesn't perhaps something better was meant to be. Sometimes, persisting in something can give rich dividends. However there is a fine line between knowing when to persist and when to turn away. Many a time, if I wanted something badly I have persisted endlessly. Most of the times I have been lucky to get it. But there are times when I have failed too. When that has happened, I have cut my losses, put it behind me and moved on. On the first glance, you might not perceive a difference between persistence and pushing yourself. Persistence is doggedly chasing something where the final outcome is not in your hands. Example, before I became a published author, I used to persistently take part in a writing prompt on something called Writers Island, week after week. After I became a published author, I push myself to keep a track of my word count, I push myself to sit at the key board and churn out those words. I might decide to junk it the next day--but write I must, push myself I must. Make a promise to yourself and keep it up, no matter what. Promise can be about anything--maybe a toxic relationship that is pulling you down? Maybe that you will walk away from everything that makes you unhappy. Maybe a promise that you will try to see the best in everything . Maybe a promise that you will be kinder to yourself. Most of us are so harsh on ourselves. I found this visual which I have pinned on my pinterest, which resonated with me. So make that promise to yourself today! This is somehow deeply ingrained in us and soemtimes, we fail to give ourselves credit. if anyone praises us, we feel extremely uncomfortable and say "oh I was just lucky." But I do believe you need a certain amount of pride to succeed. You should be proud of how far you have come from where you were. You should have pride in your work. May all success be yours! ps: Liked this post? Want more like these? Let me know by leaving me a comment below. great tip mam... thank u !!! I am so so happy to see this post.... It really lightened up my day :) Thanks Preethi...... most of your posts are very encouraging , which is what people like me exactly need :D I loved the last one , Pride. Its so so true that we seldom give the credit to ourselves. It was a truly inspiring post dear... Loved it! I have written them on a piece of a paper stick them at my workplace. From last few days I have realized that its really very important to keep yourself happy before others. All credit goes to your writing. Good to read something well written and sincere. It shows in your writing. Happy New Year ! 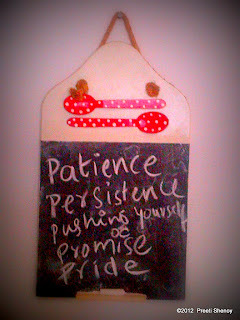 Hi Preeti,loved the idea of blackboard & 5 'P's too. got to read it just when I needed it the most. Thanks n all the best for your new book. And that pride part of it I have to honestly say you have taught me...I've always been depreciating abt 'me'. Your blog that way had been an eye-opener. Thank U!!!! Though one cannot hold pride, one should not underestimate oneself. I am reading this post a tad late so I hope you'll read my comment - There are times when I copy paste and keep your posts in my personal folder so I can read them again and again and get inspired and motivated. Thank you for writing such posts and hugs to you !